NGC 3201 is a globular cluster located approximately 16,600 light years away in the southern constellation of Vela. 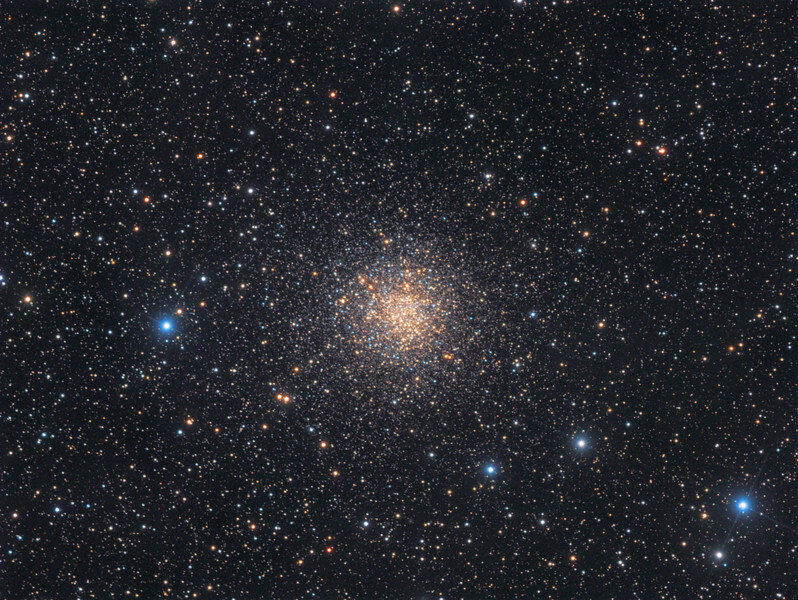 The cluster appears as a fluffy ball of stars with a rather loosely concentrated core, unlike some other globulars with very dense cores such as 47 Tucanae and Messier 80. The diameter of the cluster is around 40 light years and it contains the mass of an estimated 254,000 Suns. The cluster orbits our galaxy with an unusually high velocity of 490 km/s. Interestingly the cluster has an inhomogeneous star population, with hotter bluer stars located further out from the core. this is visible in the image where many blue stars can be seen in the outskirts of the cluster, while the core with the predominantly older stars appears more reddish.